Giving birth naturally, according to Vicki Noble, is a "peak shamanic experience" for a woman (Shakti Woman). When women give birth in wide-awake consciousness, we are given the opportunity to know how we are in relationship with the mysterious creative life force. Our body-wisdom knows how to birth a baby. What is required of the woman who births naturally is for her to surrender to this body-wisdom. You can't think your way through a birth, and you can't fake it. In some spiritual practices, much attention is given to the process of the rising kundalini at the base of the spine when one enjoys various "openings" in the pursuit of enlightenment. Barbara Walker refers to kundalini as the "Tantric image of the female serpent coiled in the lowest chakra of the human body, in the pelvis." Giving birth is one of the most profound human experiences of that "opening". It is kundalini moving through the birthing body, rising with every rush of energy that opens the cervix. Not only is the opening felt during these rushes, but also in-between. The opening experience has a deep resting place where the body and soul of the birthing woman gather strength to accept the coming waves of the awesome kundalini as it continues to move through her, culminating in the birth of a new life. When I gave birth, I had the experience of feeling that I was the All, and the All was me, and that we were in this ecstatic dance together. I was the created and the creator at the same time, the dreamer and the dreamed, the breather and the breathed. There was no question about "where" my spirituality was; it was not in the sky, it was in the body. It took every ounce of "great pure effort" -- a buddhist teaching of what it takes to achieve enlightenment -- to show up for the process that was moving through me. If I chose to spend time complaining, the birthing energy reflected that. It was immediate cause and effect. It was not that I had to deny pain, but I was supremely challenged to frame it in a way that would allow safe passage for my baby. I was asked by the Goddess to surrender completely to the experience, and let it take over. When I felt the energy of birthing kundalini as painful, my midwives compassionately guided me to interpret it in a different way, where I could integrate it as something that would take great courage and strength, but that I had it in me to open to it and take it in. My midwives were mothers too, and had been through the experience. They knew what they were talking about. This made a big difference in how I could create a safe passage for my child. To have compassionate mirrors telling me I could do this made it possible for me to do it. I trusted them. I had to learn to feel the energy of creation as intense rather than painful, and trust that my body was capable of handling this intensity. In giving birth, I also learned about the nature of surrender. Many spiritual teachings tell us that surrendering is essential to spiritual well-being. We need to learn that we are not the center of the universe, and to be open to outcome. When a woman gives conscious birth, she experiences this teaching directly. I did not know if I was going to live or die, nor did I know if my baby would live or die. Entering the unknown in full surrender, the mother is in a deeply spiritual relationship with the All. For women in patriarchy, this sacred connection is not acknowledged. What women are told is that we must go to the hospital -- the place where people go when they are ill. And what happens to us there? We are told how to give birth by a male mind (whether it be mouthed by women or men). And in these directives, we are made to feel dependent on what the male mind knows. The male mind says that women need to escape the experience, and take numbing drugs. When a woman is drugged, her baby is also. In that state, she does not get the opportunity to experience birth as a process of enlightenment -- as an awakening of her soul. Patriarchy does not want women to know this power of birth, because men will not be able to control women if women know this power inherent in our beings. For some strange reason, or reasons, men fear this power. How very odd, since it is where they come from? Men wind up fearing where they come from, and spend lifetimes trying to be better than this power, trying to control this power, being jealous of this power, fabricating male birth myths to prove they have this power. In the process, they have developed amnesia about what this power is really about and how they are part of it. Until this changes, unless there is transformation at the core, there is little hope for a peaceful existence here on this planet. Changing the faces of the cast of characters in this drama does not create a new play. The experience of my birthings also showed me the incredible power of sisterhood. 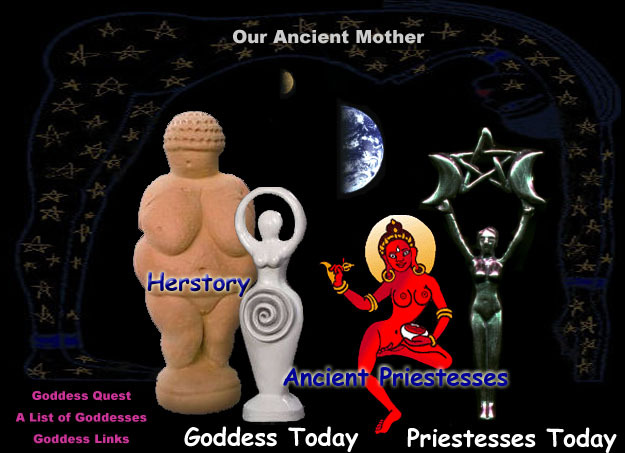 My guiding sister-midwives became the embodiment of the priestesses of the Goddess. They completely cared for me and loved me through a most difficult passage. They watched over me like angels, and took care of all my needs. Apprentice midwives stayed with me after the births, and I could just stay with my babies and bond. I was tended to by people who came and cooked, and looked after things until I was ready to resume my regular life. I was lucky to live in a place where women and children were loved. The sacredness of the time during and following the birth was honored by the entire community. Everyone had respect for a woman who had just given birth, and everyone knew that I was in an altered state. My male partner was able to witness the love of women, and the love of the mother and child. He was able to surrender to the process, and not be concerned about being the star. He was able to be of service. And, he was able to bond with our babies as well. He was not afraid to love them, and did not feel shame when showing tenderness. Witnessing this miracle changed him and opened his heart. He was grateful to be a part of it, and humbled by the magnitude of what women do in birth. The Goddess was everywhere. It was Her face tending me, guiding me, and feeding me. It was Her face looking back at me through the eyes of my babies, and it was Her arms that held these new beings and it was Her breasts that nourished them. Women were the first shamans. A shaman is one who flies between the worlds, and who has a foot in both worlds -- that of the seen and unseen. When a woman bleeds, she enters the world of the unseen, the world of dreams, intuition and spirits. Because we, in the west, are not educated in these ancient ways of seeing, we do not know how to embrace them. But, with Goddess re-emerging, our memories are returning, and we are re-membering. With the female group bleeding together, the collective vision is deep and profound, with far-reaching affects on the community. In matrifocal societies, it was probably true that tribal life was guided by the visions of women who bled together. Women accessing healing and wisdom in the unseen realms through their blood, in rhythm with the moon, together, was a primal shamanic art. And giving birth was also a primal shamanic art. Birth is certainly messy and bloody. It is intense, fierce, fiery and loud, but not violent. It is bloody from shamanic transformation. Birth-blood is the primordial ocean of life that has sustained the child in utero; the giving of this blood in birth is the mother's gift to her child. The flow of blood is the first sign, following the flow of waters, that signals that new life is on the way, just as it is the first sign of a young maiden's initiation into a new life at her menarche. The blood of transformation is miraculous. In Spanish, the phrase "dar a la luz", to give birth, literally means " to give to the light". Giving to the light -- mothers giving birth are giving light to new life through blood. The messiness and bloodiness of birth are the gift of the Earth--elemental chaos coming into form. Honoring mothers as the first shamans honors all of us. Recognizing that without our mother's love, nurturance, and healing wisdom we would die, shows us how to be in cooperation with the web of life. Respecting our mothers teaches us respect for the Great Mother. Men do not have to be jealous of not giving birth. Instead of focusing on what they don't do, they can focus on what they do. Men can rejoice that they emerge from such sacredness, and are tended to, nourished and loved by Her. They don't need to wage war against Her because they don't do what She does. She has provided them with other mysteries to unravel. Men need to spend time figuring out what these mysteries are, instead of what they are not, and not blame women or the Mother for their own internalized perception of inadequacy they have developed as a result of fear and competition and the dreadful teaching of "separation." It is essential for women to return to the wisdom of our bodies and to reclaim our power and our wisdom inherent in our femaleness in order for global transformation to occur. It is essential for all humans to surrender the fear of Her and allow Her to once again guide our lives. For without Her, we are clearly headed for extinction -- the only outcome of denial of our Mother.